After we have discussed the concepts during class and you have reviewed the PowerPoints for each of the areas that are located below, you will use my Moodle site to take worksheets and tests. The concepts and technical information you will learn in this unit can help you create stunning audio productions that will accurately accomplish the purpose you intend. 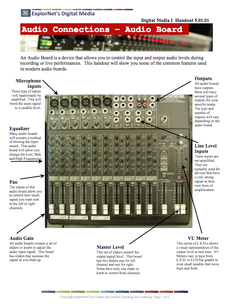 Audio can make or break a digital media production, so it is important information to learn and understand. Worksheets are going to be taken on my Moodle site. These meant to provide you with feedback on how well you are learning the material, and should be attempted as many times as it takes for you to master the content. Tests will be taken using the Elements Testing Platform. Tests are assessments of your knowledge and will take place during class in a controlled setting. Use these PowerPoints as a resource for the worksheets, and to help study for the tests! The PowerPoint I used during class lectures about Audio Production is located in the viewer to the left. Use it as a resource for the worksheets, and to help study for the tests! 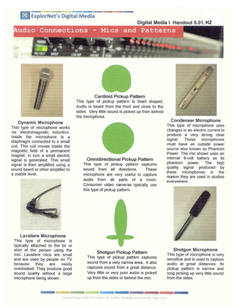 The PowerPoint I used during class lectures about the Audio Procedures is located in the viewer to the right. Use it as a resource for the worksheets, and to help study for the tests! foster student learning where success is the only option."